Saugus, Calif. A sighting of three large mountain lions Sunday had residents of the town of Saugus, in Santa Clarita, Calif., on edge, reports CBS Los Angeles. Residents spotted the cats Sunday afternoon around 4:30 p.m local time. "My husband and I were looking through the slider because we didn't want to come out and we looked and [it wasn't one], there were three. Just strolling down to our fence." said resident Cindy Lofstrom. Rachel Kim, reporting for KCAL9, said residents were a little nervous about the sighting. Only Lofstrom's six-foot-high fence kept the cats at bay. "To see them in the afternoon hours was scary," said Lofstrom. Resident Nick Collins, who lives across the street from Lofstrom, saw the cats, as well. He was trimming a tree when he saw one closer than he would have liked. "It was about four feet long, you know. Easily," he said. The cat caught his eye and then he realized there were two more. "They were just casually walking along," he says, "looking around. Looking at me." Lofstrom and Collins both said they were too shocked to think to grab a camera. "I've heard there's a drought situation [in the mountains], so the animals are coming down here," said Lofstrom. She said this is her first encounter with wildlife. 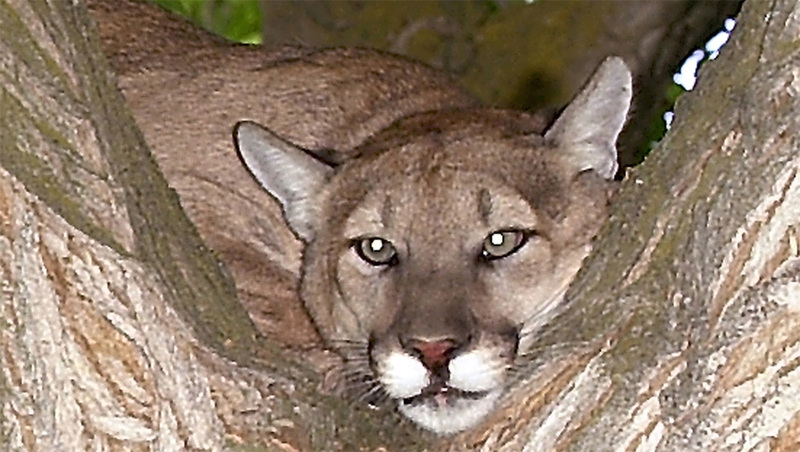 "We've been living here for about about 30 years and I've never seen a mountain lion," she said. Both Lofstrom and Collins said they will be ready for the next sighting. "My dogs will not be out during the day at all," said Lofstrom. "I'm going to have my camera ready," quipped Collins.